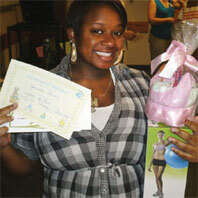 Jameila Daniel proudly holds up a certificate and the gifts she earned by attending every prenatal course offered by NorthBay’s ABC (A Baby’s Coming) Clinic. The Art of Breastfeeding—Learn the “how to’s” of breastfeeding. This class addresses the health benefits for mom and baby, the role of the father, the working mom and more. Cost: $15. Call (707) 646-4277. Brothers & Sisters To Be—Prepare children ages 3-9 for the arrival of a new baby. Cost: $10 per family. Call (707) 646-4277. C-Section Preparation—Individual counseling available to women delivering at NorthBay Medical Center who may require a C-section. Cost: Free. Call (707) 646-4277. Discipline is 1-2-3 Magic—Simple, effective discipline strategies for children 2-12. This program is easy to learn and it works. Cost: $30 per couple. Call (707) 421-4155. Labor of Love—A six-week prepared childbirth class for moms and dads or coaches; register in fourth month of pregnancy or earlier. Cost: $75. Call (707) 646-4277. Labor of Love in Review—One-session child-birth refresher course for moms and labor partners. Pre-requisite: previous attendance in a prepared childbirth education course. Cost: $20. Call (707) 646-4277. Prenatal Care—Expectant mothers learn important information about pregnancy. Topics include nutrition, exercise, fetal growth and development, “pregnancy do’s and don’ts,”and much more. It is recommended this class be taken as early in pregnancy as possible. Cost: $10. Call (707) 646-4277. Maternity Orientation and Tour—A tour of the NorthBay Medical Center’s maternity unit. Information about hospital registration, birth certificates, and available birthing options provided. Cost: Free. Call (707) 646-4277. Newborn Care—Expectant parents are instructed on daily care, nutrition, safety, and development for the first few months of life. One-session course. Cost: $15. Call (707) 646-4277. Parenting in Today’s World—This course covers the emotional needs of children from birth through 19 years. Call (707) 421-4155. Baby Sign—Parenting the Young Toddler (9-24 months)—This class helps parents understand the unique needs of a toddler. Call (707) 421-4155. Parent Project Jr. (5-10 years)**—Six-week parenting skills program created to help parents prevent and intervene in destructive behaviors. Class is taught in English and Spanish. Call (707) 428-7327. Parent Project Sr. (11-18 years)**— A highly structured parenting skills program created to help parents prevent and intervene in the most destructive of adolescent behaviors. Class is taught in English and Spanish. Call (707) 428-7327. Siblings’ Birthing Preparation—Parents who are considering having children present during delivery can have one-on-one counseling. Cost: Free. Call (707) 646-4277. Twins and Triplets Socialization—Solano Parents of Twins and Triplets offer socialization and support to the parents of multiples in Solano County. Cost: $27 annual fee. www.solanotwins.com. Amelia Schansman-Farmer holds a practice baby and listens intently during a prenatal class. Caregivers’ Support Group—Anyone involved in caring for a loved one with Alzheimer’s disease or a dementia-related illness is invited to participate. Monthly. Cost: Free. Call (707) 624-7971. SAND (Support After Neonatal Death)—Friendship and understanding for parents experiencing grief over the loss of a pregnancy or infant. Cost: Free. Call (707) 646-5433. Grief and Bereavement Support Groups—Adult support group is on-going. Cost: Free. Call (707) 646-3575. Teen and Children’s Bereavement Support Groups—NorthBay Hospice & Bereavement offers free bereavement support groups for teens, age 13 through 17, and children age 6 through 12 on an as-needed basis. Cost: Free. For a schedule and more information, call (707) 646-3575. Anger Management—Understanding Your Anger—This interactive class will help participants analyze and change their behavior. Topics covered include Understanding Self Control, Stress Management, Communication, and Understanding Role Models. Cost: Free. Call (707) 421-4155. Look Good, Feel Better—A program to help women currently undergoing cancer treatment cope with appearance-related side effects of treatment. Register for classes by calling the American Cancer Society, 800-227-2345. Cost: Free. Call (707) 646-4075. Electric Hearts Support Group—For patients and their families learning to live with implantable Cardioverter Defibrillators. Class meets quarterly. Cost: Free. Call: (707) 646-5074. The New Beginnings Stroke Support Group— Provides participants an opportunity to connect with others that have similar experiences associated with stroke. Group meets third Tuesday of every month. Topics include: impact on daily living, coping with challenges and stressors, treatment and available resources. Cost: Free. Call (707) 624-7015. PEACE (Parent Education And Custody Effectiveness)—Create an effective parenting relationship between divorcing and separating parents. Endorsed by judicial and parenting advocates. Classes meet on Saturday. Call (707) 421-4155.